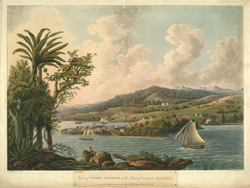 An aquatint of Port Antonio in Jamaica by French landscape artist Louis Belanger (1736-1816). Port Antonio is the principal town of the parish of Portland and is located on the north eastern coast. An island separating the two harbours at Port Antonio is called Navy Island, so named because it was used as a base by the British Navy in the seventeenth century.